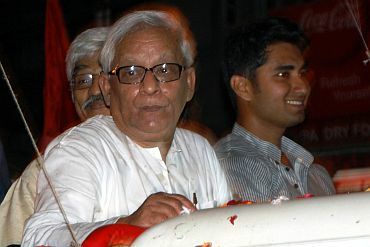 Keeping pace with the high-pitch campaign by main opposition Trinamool Congress, Chief Minister Buddhadeb Bhattacharjee on Saturday organised his first roadshow from his Jadavpur constituency and said the ruling Left Front would return to power for the eighth term. "I am overwhelmed at the large turnout at my roadshow and I am certain that nobody can prevent us from returning to power in the state," Bhattacharjee told mediapersons from an open jeep. 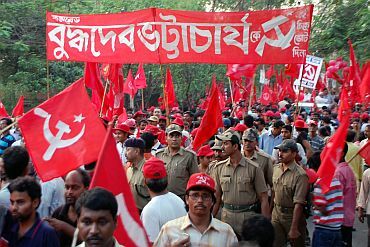 Thousands of Communist Party of India-Marxist and other Left Front constituent workers took part in the 'padayatra' which started from the gate of the Jadavpur University and terminated at Kamalgazi in South 24 Parganas district covering a distance of 8 km. 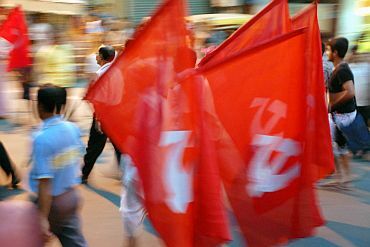 The chief minister was accompanied by three other CPI-M candidates from Kasba, Tollygunge and Sonarpur (North) seats. "I actually wanted this kind of response to my roadshow and this indicates that people have been turning towards us and they have hit the streets as they are politically conscious," he said. Bhattacharjee, who gave autographs, received bouquets, shook hands with voters and waved at the crowd, denied reports that he had been "forced" to remain confined to his own constituency. "I'll go around everywhere. I am happy that people of all ages have responded to our roadshow," he said. People lined up both sides of the roads as processionists holding placards and party flags marched to Kamalgazi with women and young cadres at the front.